DONATE TOYS VIA OUR GIFT REGISTRIES! Our biggest need is toys! We will begin receiving new toys September 15th. During the month of August, we will be surveying the parents of the children to gain insight into favorite toys and use that information to build gift registries at Target and Amazon.com. We would greatly appreciate your using the gift registries, but of course all new toys are welcome. Please target gifts for children ages 2-17, and please be aware that the 12-17 age group comprised 37% of toy need in 2017. Churches and businesses might want to explore and support our Giving Tree option (see special tab). Shopping online is easy, convenient and the way many of us shop. Just use the links to the right to directly access gift registries at Amazon.com and/or Target. If you have any problems accessing the online registries, please call 321-345-0094 or email giftsfromtheheartchristmasshop@gmail.com for assistance. Neighbor Up Brevard Club Esteem Love INC of Brevard, Inc. Family Promise of Brevard, Inc.
P.O. Box 1253 2226 Sarno Rd. #107 4087 US Hwy 1, Suite 2 4515 Babcock St.
Additionally, new gifts may be dropped off at Village Thrift between September 15 and November 27, 2018 during normal hours of operation: Monday-Saturday, 10am-5pm. Village Thrift is located at 830 N. Apollo Blvd. Melbourne, FL 32935. Please be sure to state that your new toys are for the Gifts From the Heart Christmas Shop to distinguish them from other thrift store donations. Please remember that you can find our most needed items on the gift registry lists! 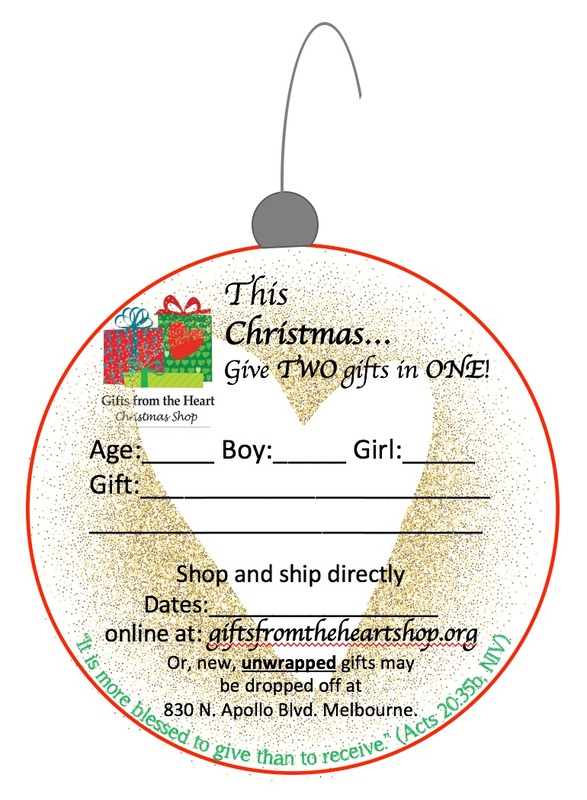 Houses of Worship and businesses have another yet another option for helping Gifts From the Heart Christmas Shop...our GIVING TREE program. Designed to provide a visible and familiar means of support, the Giving Tree option is similar to an Angel Tree in that the church or business puts up a tree during the month of November. The tree is decorated with GFTH "ornaments" with information on a toy need from the gift registry. Church and business Giving Tree hosts collect the toys once purchased, display them under their tree and deliver them to the Village Thrift in time for the Shop opening on December 1st. Alternately, they might encourage their members and patrons to use the Gift Registry to purchase the toy. The ornaments provide the necessary contact information. For more information on the Giving Tree option, please call 321-345-0094. DONATE TOYS VIA OUR GIVING TREE OPTION! Our Gift Registries are now closed, so the links have been removed until GFTH 2019. Thank you to all who supported GFTH in 2018! We are deeply appreciative of the support of the community of Brevard for the amazing generosity it showered upon Gifts From the Heart Christmas Shop 2018. The shop's final day was December 11th. Please check out the 2018 Report page for details on the success you made happen. Also, please check back to this site next summer for updated information on how to help GFTH Christmas Shop 2019!